A handsome bag featuring the U.S.S. Enterprise! Durable nylon tote with inner pockets for additional storage. Duffle bag measures 18 1/2-inches long x 12-inches tall x 5-inches wide. Carry a change of clothes or school/work supplies in Star Trek style! Beam up your bag! A handsome bag featuring the U.S.S. Enterprise, this Star Trek Original Series Retro Duffel Bag is just right for carrying school and work supplies and a change of clothes for the gym, beach, or whatever day-trip you have in mind. The bag is made of durable nylon, with screen printing and a tri-color appliqué, and features double strand handles with faux-leather details and reinforced stitching. The front zip-pocket includes a custom Star Trek zipper pull, and there are inner pockets for additional storage. 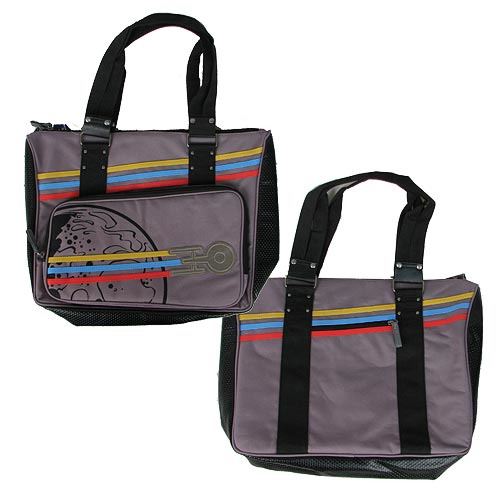 The Star Trek Original Series Retro Duffel Bag measures 18 1/2-inches long x 12-inches tall x 5-inches wide. Ages 14 and up.